Some gardeners have the best intentions for the growth and health of their plants, but inadvertently over fertilize by thinking “if a little bit is good, more will be better.” Too much can be worse than not enough. Other folks forget to fertilize then overdo it with one big dose of plant food after months and months with none. Too much at one time can be worse than not fertilizing at all. Because trees, shrubs, flowers, grasses, vines and vegetables all have individual needs there is no “one-size-fits-all” option for fertilizing: different plants need different types of fertilizers, so it’s important to become familiar with what works best for the plants you need to feed. There are some great general-purpose fertilizers, but they may not meet the needs of all the plants in your yard and garden. Very important: never fertilize a dry plant. Water it and wait until it has had time to absorb the water which is typically three to five hours or overnight. If you haven’t fertilized for a while or if you want to give plants a quick boost foliar feeding is recommended because it is the quickest way to put nutrients back into the plant. Spray the plants with plain water before foliar feeding. Never use this method in the full heat of a peak summer day (especially when temperatures reach 85ºF or above) because the action of the sun on freshly sprayed foliage can burn the leaves. How much to fertilize is based on the size of the plant and the specific composition of the soil where it is planted. Some areas around Santa Fe have soils that are heavy with clay, others are more sandy or loamy. The Santa Fe County Extension Agency on Rodeo Road is a great place to get specific information about local soils. We also recommend testing your soil so you know what you’re working with. The simplest option is to purchase an inexpensive pH test kit from either of Payne’s Garden Centers. Water-soluble fertilizers must be mixed with water each time they are used, but this form makes them readily available to plants. Osmocote is one of the most popular time-release fertilizers. Time-release fertilizers break down over a period of several months. How quickly it breaks down is primarily due to soil temperature and moisture. The manufacturer’s directions on the packaging are usually clear about the mixing ratio and how often to apply. 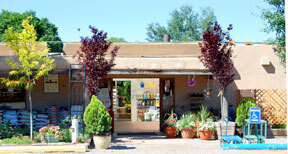 For more help, come in to either Payne’s Garden Center.